I got what I paid for now. I know that Beer Soaked Stew is our resident Belgian beer aficionado. So I thought I should give that style of brew a chance again… perhaps you’ll go Waltzing Matilda with me. I’ve had a few Belgian style ales in the past, and it’s been a while. I recently read quite a few good things about Goose Island Beer and the awards they’ve won over the years, (and a not-so-flattering article about their acquisition by big beer). I’ve also been a long time fan of Tom Waits, and his soulful version of Waltzing Matilda, “Tom Traubert’s Blues” has always been one of my favorites. And he’s gotten both good and bad reviews over the years too. So when I saw Matilda on the shelf at one of my local beer stops, name recognition was the first thing that made me pick this one up. My expectations were high going in. What did I think of it? Keep reading. 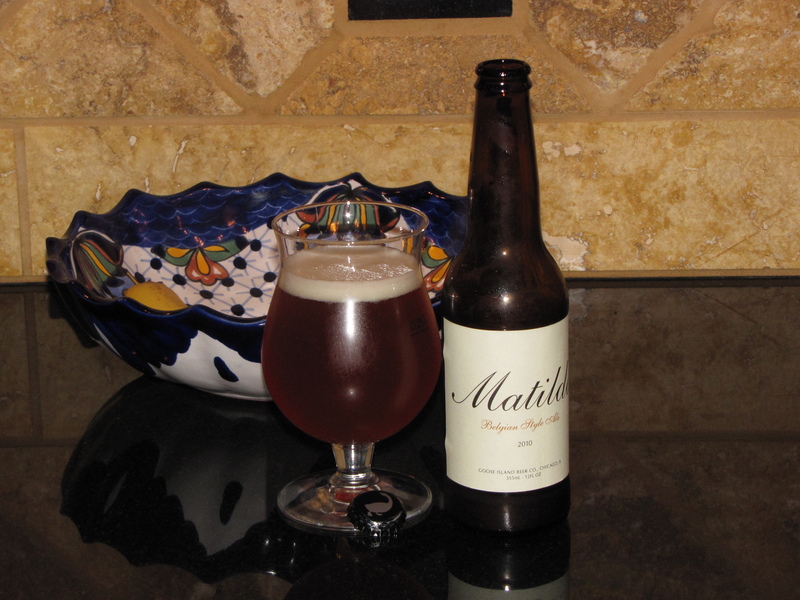 Wild in character, with a slightly fruity aroma and a spicy yeast flavor that is as unique as it is satisfying – Matilda is an intriguing choice for beer and wine lovers alike. Dry and quenching, it’s the perfect accompaniment at the dining table or for casually socializing at the bar. Develops in the bottle for up to 5 years. What do Tom Waits and Goose Island have in common? …soul. (Make sure that the youtube track is playing while reading this, it helps.) This is a beer with a lot of character too. It pours in the glass a light amber color with about a half inch light and fluffy head. (Tom Waits has never been accused of having a fluffy head to my knowledge.) The date on my bottle is 12/21/2010, so this is just over 1 year old. It has a nice floral bouquet, which sets the tone before the first sip. This one is sweet, with lots of fruit flavors right up front, pear, banana, and lemon. There’s a hint of spice too, maybe clove, but it’s very subtle. The mouthfeel of this one is very elegant, with light delicate carbonation. I poured it into a Duvel tulip, but it might belong in a champagne flute. But what do I know? It tastes almost like banana bread in a cup. Sweet, with a hint of spice. I could feel the 7% alcohol on the tongue, this one is a sipping beer for sure. I enjoyed it while listening to Tom Waits. They seemed to pair together nicely. So if you’re a fan of banana bread, then this is definitely for you. If you’re not a fan of banana bread, then perhaps you’ll enjoy listening to Tom Waits. I actually enjoyed both, Tom Waits and Goose Island’s Matilda. I am aging a couple of these bottles and will see how they fare in another year or so. I know some have voiced their concerns about Goose Island losing it’s soul by selling to InBev, but I didn’t taste a soulless beer here. It was well crafted, and I’d buy it again. It gets 3.5 beer soaked caps from me. Feel free to disagree with me. This entry was posted in Ale, Belgian, Review and tagged 3.5 caps, 7% Style Ale, beer, Belgian, Goose Island, Matilda, Tom Waits by Erik. Bookmark the permalink. 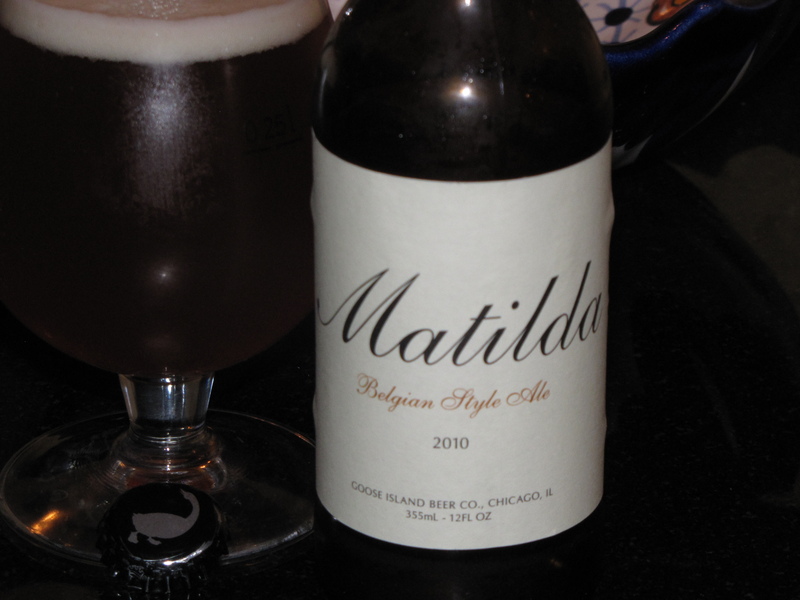 Hmm… we just posted a review of the Goose Island Matilda yesterday as well. Limpd, the Booze Dancer that had the beer and wrote the review, also enjoyed the Matilda. And our good friend @thealemonger has one on ice for this evening. Since all roads are leading to Matilda this week, it would seem that I now need to take a mini road trip to Maryland for some beer, since that is the closest place that I can get some Goose Island. And as far as Tom Waits goes, I am a huge fan! Have you picked up Bad As Me? It almost feels like he went back, looked over his entire career, and wrote a series of new songs that highlight all of his best work. Great stuff! Thanks for the pointer to the review G-LO. Seems like Matilda is the bridge all your friends are jumping off this week. 🙂 Come on and join us. I just checked out the review by limpd and it seems we had a similar experience with this beer. Good luck getting your hands on a bottle of Matilda and I’ll work on getting “Bad As Me”. Thanks for the album review. Cheers!